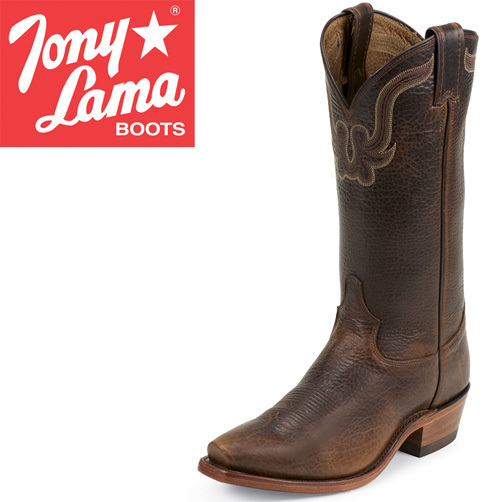 Distinctive style, superb attention to detail, and the signature of an esteemed artist Handcrafted by master bootmakers, these boots from Tony Lama incorporate the finest exotic materials, exquisitely hand-tooled leather, and cutting edge comfort technology. Handcrafted in the U.S.A, this boot features exotic bison skin leather with full-welt construction and full cushion foot bed with scored insoles. Features a 13" Dark Pecan Rowdy Bison top and foot. Other features include "D" toe, size 4 heel, full-welt leather outsole, and cushion insole. Color: Dark Pecan Rowdy Bison. Size: 10.5D.